Batik has been Rosi’s passion since her early twenties. She has travelled, lectured and exhibited her batik paintings throughout the world, including China, Japan, Indonesia, USA, UK. Europe and of course here in Nova Scotia. Originally from Edinburgh, Scotland, she now spends more of her time in Chester, where her grandmother was born. Rosi has pushed the technique of batik - traditionally a Far Eastern technique of decorating fabric - in her own personal and figurative way. Inspired by her travels, Rosi applies hot wax onto cotton fabric to resist layers of colorful dyes working from light to dark. 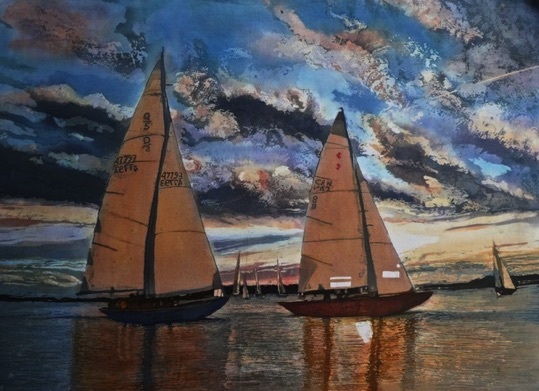 Rosi’s pictures are often mistaken for watercolor paintings but are more intense in color and are unique in quality. Rosi has exhibited at Amicus Gallery since 1998. She recently retired from full-time teaching and so now spends more time on her own work. If you are interested in taking a batik workshop with Rosi, please contact her on rosirob@aol.com or www.rosirobinson.com.